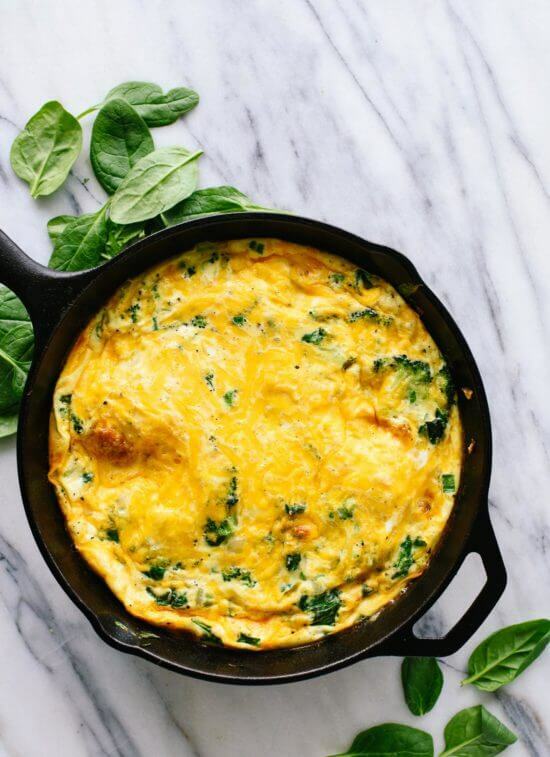 This spinach, broccoli and cheddar frittata recipe is a simple breakfast, brunch or dinner! It’s vegetarian and gluten free. Recipe yields 6 large or 8 more modest slices. Preheat the oven to 220 °C (200 Fan). In a large bowl, whisk together the eggs, milk, garlic, ¼ teaspoon of the salt and about 5 twists of freshly ground black pepper until well blended. Then whisk in about half of the cheese, reserving the other half for later. In a 10-inch, well-seasoned cast iron skillet or oven-safe sauté pan, warm the olive oil over medium heat until shimmering. Add the onion and the remaining ¼ teaspoon salt. Cook, stirring frequently, until the onion is tender and translucent, about 3 to 5 minutes. Add the broccoli and water to the pan, then cover it with a lid (or a baking sheet) and steam the mixture until the broccoli is brighter green and easily pierced by a fork, about 2 to 3 minutes. Uncover, and add the spinach and green onions. Cook, stirring constantly, until the spinach has wilted, about 30 to 60 seconds. Arrange the mixture in an even layer across the skillet. Whisk the egg mixture one last time and pour it into the pan. Sprinkle the frittata with the remaining cheese. Put the pan in the oven and bake until you can shimmy the pan by the handle (careful, it’s hot!) and see that the middle is just barely set, about 12 to 15 minutes. Once the frittata is done baking, let it rest for 5 to 10 minutes before slicing it into 6 large or 8 smaller wedges. Serve immediately. Leftover frittata will keep well, covered and refrigerated, for up to 3 days. Enjoy chilled or gently reheat. MAKE IT DAIRY FREE: Use a neutral-flavored, unsweetened non-dairy milk and omit the cheese. CHANGE IT UP: For a classic broccoli-cheddar frittata, simply omit the spinach. Or, substitute your greens of choice—baby arugula and chard would work well.